This week, the search has been on for a cupboard or chest of drawers for a specific project, but hard as I have tried, the right piece has evaded me, though I did spot this sweet vintage school desk. After promptly leaving the shop, telling myself that, “no, it is not a cupboard and it is not a chest of drawers”, I started to feel a bit sick incase somebody else found it and so I literally ran back in and bought it! To begin with, I gave the whole desk a light sanding and wiped it down with warm soapy water, followed by neat bleach. Once dry I then added the stencil pattern. 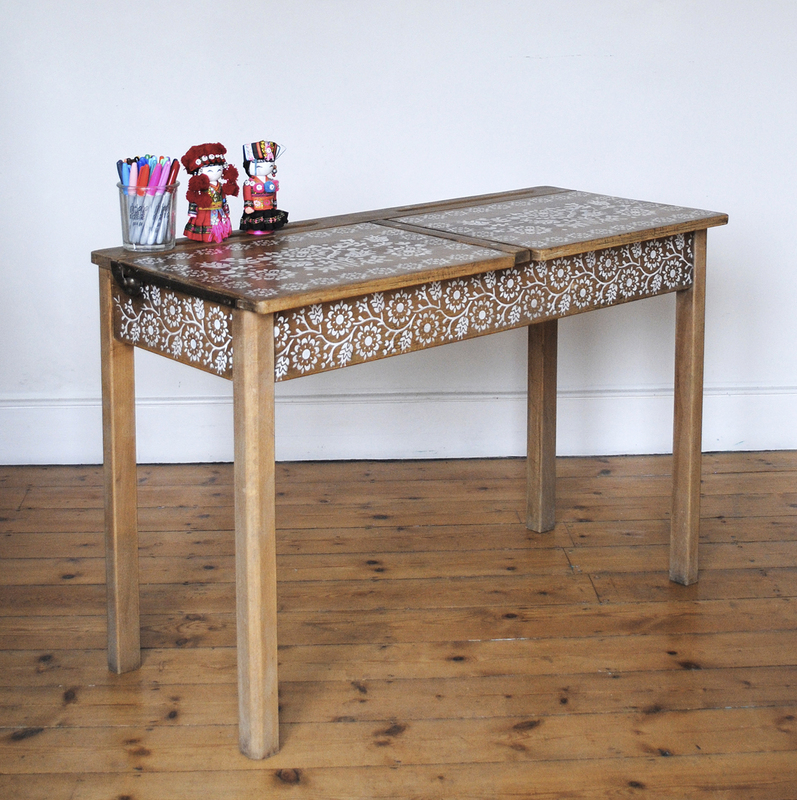 The Bergen Border fitted perfectly onto the sides and I built up the design on the tops of the desks using the Malmo and Lund stencils. The interior of the desks have been painted with a white eggshell, but the inside of the lids left unpainted. The whole piece has had a couple of coats of varnish applied with an extra coat on the top. This desk has a lot of history which is still visible, there are dints and dents, some accidental, but some have obviously been gouged in by mischievous little children. I wonder who the next mischievous little hands will belong to.